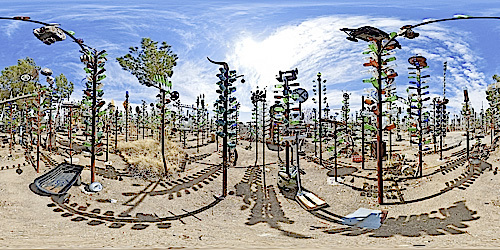 Bottle Tree Ranch is a quirky, on-going outsider art installation/domicile located on National Trails Highway (formerly and more famously known as Route 66) in a town called Oro Grande just outside of Victorville. Similar to Hulaville, a defunct roadside attraction that at one time could also be found on Route 66, Bottle Tree Ranch is a collection of junkyard treasures including old bottles, typewriters, Lionel train sets, sewing machines, buffalo nickels, the kitchen sink and much more that have all been transformed into a dense forest of mixed media sculptures. 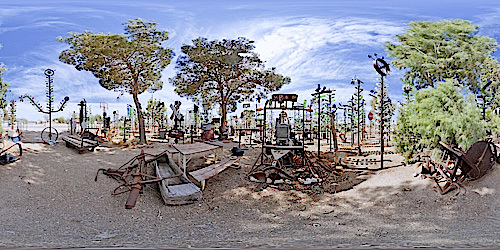 This past Easter Sunday I set out with my mom and sister to check out Bottle Tree Ranch and take these panoramic photos. 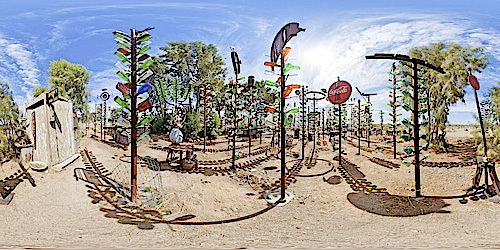 (Click through the images below to view the panoramas in 360.) The place lends itself well to photography and it's worth noting that photographer Dave Wyman teaches workshops at the ranch regularly. However, for panographers like myself, the shadows the trees cast can be rather tricky to work around and obtaining a good panorama was a challenge. 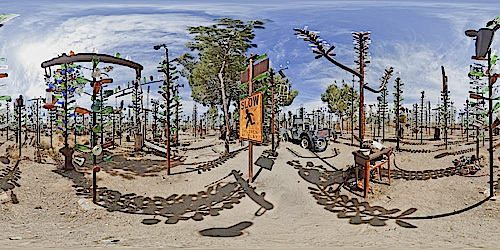 In addition to kinetic art and sculptures, Bottle Tree Ranch is clearly an inhabited home and while the front gate has welcoming signage to let yourself in, I felt it was only polite to knock on the door and introduce myself to the artist Elmer Long and Linda, his wife of 40 years. Elmer is an extremely affable man who will talk your ear off with stories about his life, his love, his art, his family and his beliefs. I get the sense he's told all these stories a million times because his work attracts thousands of visitors world-wide and yet it's as if he's telling them to you for the first time. As Elmer showed me around, a gentle desert breeze animated windmills and hanging mobiles that he designed to create an enchanting tinkling fairy-like sound. Hummingbirds and honeybees dart all over the premises sipping nectar from feeders while sparrows collect twigs to construct their nests high above the top of the bottle trees. It truly is a magical place. 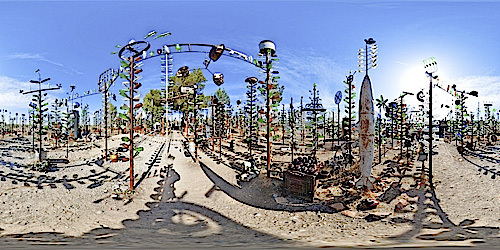 Bottle Tree Ranch is located at 24266 National Trails Highway, Oro Grande, CA. If the gate is closed, Elmer says to let yourself in.